The present example is an unusually vividly colored piece of fossiliferous limestone, the large fossil cross-sections providing a particularly striking natural design. For four other bottles carved from a similar type of limestone, with a reddish-brown ground suffused with lighter circular markings, see B. Stevens, The Collector's Book of Snuff Bottles, nos. 666 and 671; M. Hughes, The Blair Bequest. Chinese Snuff Bottles from the Princeton University Art Museum, p. 85, no. 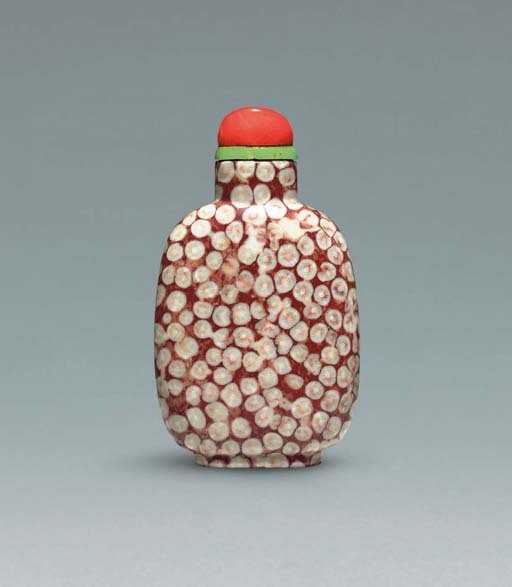 80; The Victoria and Albert Museum, illustrated by H. White, Snuff Bottles from China, London, 1992, p. 115, no. 1; and one formerly from the J & J Collection and sold in these rooms, 30 March 2005, lot 46.